Being the emcee for an event can be a huge honor and responsibility. 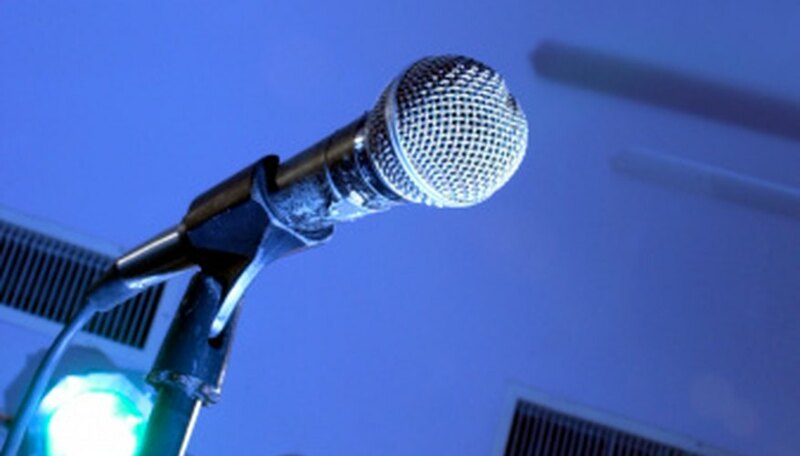 An emcee, or "MC," is an abbreviation for the title "Master of Ceremonies." An emcee serves as the host for a dinner, show, party or other event. A good emcee can make the event a huge success, and a bad emcee can ruin the time for everyone. Thankfully, by practicing your stage presence and following some basic rules of emceeing, you will be able to host a night that everyone will enjoy. Practice an introduction and the names of any people or places that you are going to have to announce while you are on stage. Messing up an introduction can set a negative tone for the rest of the night. Additionally, pronouncing a name wrong is embarrassing and unprofessional. Review the timeline for the evening and know how long you are supposed to be on stage. A good host is in control of the flow of action throughout the event. Walk on the stage with energy and a smile on your face. The crowd will not get excited unless you are. Speak clearly and directly into the microphone so everyone can understand you. Additionally, make sure anyone you are speaking with also talks into the mic. Ask the audience questions and develop back-and-forth banter with the crowd. This is most effective when the audience setting is intimate, meaning the people are visible and close to you. In larger crowds it may be easier to just stick with pre-planned material. Select material that will be appropriate for the crowd that you will be talking to. For example, the jokes that you would tell in front of a group of young adults may be different than the jokes you would use for an audience of small children. Introduce whoever is following you by first listing their accomplishments or notable achievements. End your introduction with the person or group's name, as the audience will use that as a cue to begin applauding. Maintain high energy throughout your time on stage.